1 Mix together the chutni and honey. Spread over the steaks and leave to marinate in the fridge for 15 minutes. 2 Meanwhile, prepare the cucumber salad. In a medium bowl, combine the cucumber with the red onion, rice vinegar, sugar and a pinch of salt. Set aside. 3 Heat half of the oil in a large frying pan over a medium-high flame. Fry the steaks in 2 batches, for 2–3 minutes, turning once until nicely browned but still a little pink in the centre. Make sure to wipe the pan in between and add a little more oil for the second batch. Once cooked, use a sharp knife to slice the steaks into thin strips. 4 Cut the baguette into 6 even lengths then slice each in half and spread with a little mayonnaise. 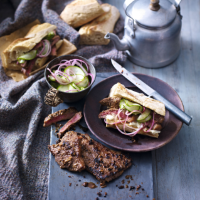 Place some steak strips in each one, then top with a generous helping of cucumber salad. Serve swiftly, while still warm. For extra colour and crunch, try adding some finely sliced radishes to the cucumber salad.